It can be hard to keep the kids entertained during the Winter holidays because the weather can make it hard to get out of the house. Luckily the Winter holidays only last for 2 weeks! Ice skating: Garema Place in Canberra will be turned into a Winter Wonderland for three weeks. You can ice skate, toboggan or ride the giant inflatable slide. There will also be European food stalls and markets. It’s on from 23rd June to 17th July. Prices start at $8 including skate hire. Sport: The Australian Institute of Sport run a large range of fun sporty holiday activities for the kids including, swimming, soccer and lots more. Prices vary on activity. Runs both weeks of the school holidays. Located in Bruce. Drawing: The National Portrait Gallery runs an explore time with drawing and creative activities. Price is $5 per child, adults free. On July 2nd to July 17th at 11am. Mini golf: Located in Griffith the Power Kart Raceway has a magnificent glow in the dark mini golf course that will thrill the kids. Prices start at $8. Got to love mini golf, I’m a fan. Oh we’ll be sure to check some of these out! Thanks for the tips. The glow in the dark golf sounds awesome. 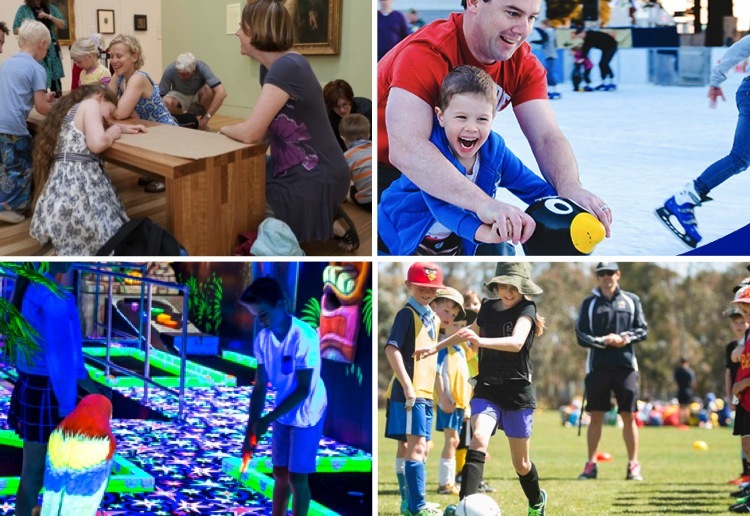 Great tips for Canberra – ice skating would be the way to go. Would love to take the kids to the ice skating. I’ve heard from friends it’s great. A number of these run all year – they’re great. We recently spent some time in the ACT and it’s a great place, and very educational for children. The National Museum is just fantastic, and there are tours of Parliament House that both adults and children would find interesting. I also really enjoyed spending time in the Old Parliament House. I love the idea of the National Portrait Gallery art’s sessions! I have those 3 movies in my list of things to do during school holidays too. And I booked my daughter in an Aviation Engineers workshop for one day. That workshop sounds really interesting! Thanks for the Canberra list – love these helpful lists. Ice Skating at the Winter Wonderland would be mine first choice if l was going to Canberra! Ice skating is so much fun and prefect for Winter.